While credit card company account holders are ranting all over the Internet, and on this site in the form of comments in response to various posts, the purpose of this page is to provide a place where we can collect ongoing rants and about the abuses of credit card companies, the lack of regulatory protection (or enforcement) that allows consumers and small businesses to be mistreated, and whatever else aggravates you in terms of the financial services industry, bail outs, the economy, challenges paying bills or selling homes, executives “living large” on your dime, and this whole tangled mess. We know you are angry, but do keep in mind that creating a sound argument supported by facts is far more effective than simply cursing and screaming in print (remember that we are up against smooth-talking con-artists who get to lobby for the banking industry and “spin” their misinformation and excuses in the press because they sound articulate). Your audience is a “court of public opinion.” This site now has now gained the attention of journalists and others who represent major media organizations. So let’s rant, but also “let’s roll.” Instead of posting an endless stream of expletives, we have to beat these loan sharks and thugs who are running credit card companies (buying off Congress, influencing media) at their own game. It’s time to end the era where account holders can be terrorized by credit card companies. Explain why, here. I spent my settlement check last night took 15 minutes and two drinks to do it I’m so proud of what we accomplished. One new money making Scheme Chase is using to get you with overdrafte fees. I had a accidental overdraft to my account due to my landlord so kindly cashing a post dated check for January 1, 2011(which is another issue I have with the banking system). The email notification for the overdrawn account was sent on the 15th at 4:57 am. According to chase my account was overdrawn from 12am on the 14th with a negitive $400 balance and a $34 fee assesed for the overdraft fee(which I have a 24hr protecting as long as I deposit within 24hrs) So how was it possible on the 14th at 1pm I was able to withdraw cash if I was already overdrawn? In my opinion Chase is using new tactic to rob you, did I mention my banking fees went from $7 a month to $12 a month. I am so glad I found this site, keep up the good fight! Chase raised the interest rate on my credit card by 3% right after the passage of the credit card act. I asked them to lower it, they said to ask again in a few months. Well, it’s been a few months and they still flat-out refuse, despite me using their card quite extensively. I don’t carry a balance, so to be honest, I guess I might be overreacting, but all this small BS along with their other policy (and recent piss-poor handling of a authentication server failure) just adds up. Anyway, I have now closed out my auto-loan (refinanced event though there is 1 year left just to spite chase of the remaining interest) and checking account and my credit card will not sit on ice with no balance on it and no purchases, but I will gladly use the concierge service every day requesting what the weather will be on the moon as well as in Albania. Anyway have suggetions what else I can use the concierge service for? Anyway, I’ve opened a new credit card (same credit-union that my auto-loan is now ith) and I have a much higher credit limit and favorable terms. Screw chase. Their flat-out refusal to lower my APR repeatedly reminds me of John Grisham’s “The rainmaker” where an insurance company decides to save money by denying all claims under $10,000. I am very sure something similar to this is afoot at chase. Amen to that, Steve! I run a successful small business, I have investment properties, etc. In a nutshell, I have a strong financial statement with illiquid assets and somewhat unpredictable cash flow. To smooth out that cash flow, I do a lot of banking business. That’s what banks are for and I’m happy to pay reasonable interest for the service. Chase has made it clear to me that they are not interested in my business with the minimum payment stunt. Very simply I will go out of my way to avoid doing business with Chase or any company any of the officers ever work for in the future. The banking industry is based on trust. Chase is already bankrupt. They just don’t know it yet. As I have said in the past, no one here gets it. Chase is flush with cash from the bailouts. Its CEO’s get millions in salaries and stock options. They do not care about their credit card business right now. It is a liability them, one which they do not need. They still have to be hurt by several things to wake them up, all which to relate to a significant loss of business. This will come from the failing real estate market, which has a long way to drop yet, and the loss of current customers through mistreatment, bankruptcy and unemployment. This may take years, but it will come. When I was making a deposit at my local chase bank on an old wamu line, they pulled me aside and asked me if I was interested in their other services or accounts. I simply replied that in an economic tough time, chase was the only bank that raised my minimums two and half times, and would not compromise, even though I said I may lose my job. My reply to the banker was: never any Chase accounts, loans, mortgages, student loans for myself, my wife, and my children ever. Chase will hurt, but not for awhile. My credit limit has been in the 3-4k range for the last 10 years or so. In 2008 I went to war with Directv when they began billing me $100 for an early cancellation fee. It’s a long story that is curently being litigated by the State of Washington where I reside. Suffice to say that in late 2009 the charge appeared briefly on my credit report at all 3 major CPA’s. I was able to get the hit’s removed, but not before Chase lowerd my credit to $400. I called when a charge was denied, followed up on getting the info off my credit reports, and then called again last week and asked for my limit to be restored. My request was denied and they said I had to wait for the reason to be mailed to me. Today, I got the letter. It says that the reason for their decision was, “Too many recent requests for credit or reviews of your credit.” It also says that the decision was made in whole or in part based on information obtained from Equifax. I immediately got my online credit report from Equifax and looked in the inquiries section only to find that it says, “You have no inquiries on file.” WHAT IS GOING ON HERE? Seriously . . . if anyone out there knows anything about how this can happen please respond! Is it ok for Chase to just say that . . . even though it’s completely untrue? What could possibly be motivating them . . . and why not just tell me the real reason they don’t want to increase my limit? Citibank is now doing the same thing Chase has been doing for a while. Last year, Citi offered me a year of 0% interest and 1% minimum payment on my existing account which I had for more than 15 years, which I gladly accepted. They were very understanding of my financial situation. I have never been late on this account. A month ago, they send me a notice that the 1 year of 0% had come to an end and they congratulated me on my excellent payment history. Now, as a “THANK YOU”, Citibank is offering(forcing on) me 28.99% APR and a minimum payment of 3%. THANK YOU FOR BEING SUCH A LOYAL CUSTOMER! It’s a good thing that so many people have started class action law suits. In addition to the change in terms that have affected so many Chase customers, Chase has so many additional ways of ripping of its customers. I just hope that more people will start law suits about the dishonest business practices of Chase. I’m glad to say that I received good news from the BBB and I will finally be relieved of the wrongfully incurred late charges and interest fees that accrued since 2008. In May 2009 I receive a letter from Chase dated May 6, 2009 saying my account is past due. This is when I begin to realize the mistake that was made by me processing a purchase on Amazon without meticulously checking which account was being charged. I inadvertently made the purchase on February 8, 2009 by clicking the “proceed to checkout” button, followed by the “place your order” button using the wrong account. Again, I am under the impression this account is closed and does not exist. This belief is further vindicated by the fact that I was no longer receiving any paper statements. The Chase letter dated May 6, 2009, which presumably arrived after its inception, was my first trace of this account still existing. After paying off the Chase account in December, my account had somehow become a paperless entity. May 23, 2009 the same procedure that transpired in December 2008 was followed to pay-off the Chase account. Only this time it was followed up with a fax to create documentation of the event. My February Amazon order total was $50.98, and the past due notice said the amount due was $51.26 which was confirmed by the Chase account service personnel, so that is what I paid. How can this account be past due and at $300 today? I would also like to add that all of my other credit is intact and has never received any negative marks. Anyone have comments? Suggestions? I would love to hear them. I will be faxing this in to the Correspondence department shortly. I’m not holding my breath, but I’m not paying it either. cc: Gordon A. Smith CEO Chase Card services. In reviewing my account **** **** **** **** (member since 2003) , I notice that my APR has been increased to 18.24% from 12.24%, a full 6%. This was done without any prior notification or explanation for the increase, despite my having never been late on a payment, and usually paying those above the minimum. In the seven years I have been with Chase, I have acted in good faith and abided by the terms and conditions as outlined in our original contract. By this action I view you to be either in error or in breach. I consider this increase, if intentional, as tantamount to theft, breach of faith, tortuous interference with a contract and should this affect my credit rating, an egregious libeling of my name. I have worked very hard to maintain near perfect credit status my entire adult life and will seek ALL legal remedies at my disposal (including prosecution for material damages) to see the that it is maintained and my good name protected and respected. It is regrettable if JP Morgan deems it nonobligatory to abide the same lawful standards and ethics as those of its customers and competitors. I intend to avoid being taken victim in the wholesale larcenies being perpetrated in the banking industry. The actions of JP Morgan Chase in particular, your subsidiaries and counterparts, seem determined to destroy the financial industry along with the economy of the nation that birthed it. I have prepared for this occasion. I am confident that my character and reputation will be sufficient to see me through the coming years without the services your company has provided to date and am prepared to sever my relationship with JP Morgan Chase effective immediately. I have written to give Chase this single opportunity to restore our account to its previous status and original APR of 11.9%. Until such time as that is accomplished you can expect further remittance and communication from me to cease. I will ignore you entirely hereafter. By acting in a criminal fashion, arbitrarily attempting to raise my cost of living by more than $100 a month at the height of an economic crisis without any service to show for it, value added for it, or cause to do so, you have reset the playing field and forced me to participate with you the same level of ruthlessness, underhandedness, and back dealing that you have yourselves employed. You have also provided me an opportunity to participate in the constitutionally mandated revolt that has been provoked by the over-reaching greed of U.S. banking cartels. Thank you for the singular opportunity to serve my country in that way. Your next step as an Executive at JP Morgan is to take a look at my seven year history with you, in light of 25+ years of perfect payment history, and make the decision. Do you want seven more, or do you want to write down $17,950.00 of good money reliably at work in the marketplace today? Go ask Mr. Dimon what is better in his opinion: Same size piece of pie? Or no pie at all? I have lived up to my obligations and kept good faith with you, my other creditors, and all my relations private and professional. I will continue to do so according to the rule of law and basic civic decency. I have always believed in fair and honest dealing and lived so that my word is as good as my contract. My credit history reflects this ethic and it is with the full weight of that 25+ year history that I promise you that if the exact terms I have stated are not met, you will have forfeited the principal amount of my outstanding balance and all future interest thereof. I say this without rancor, compunction or equivocation, as a statement of simple fact to assist in your calculations. It is my sincere admonishment that as a company, and individuals within JP Morgan Chase, you will return to those same principles which allowed you to fuel prosperity and innovation in the past and turn away from the self destructive futility evinced in these dishonorable, short-sighted, criminal tactics. As potentially one of thousands of small cut’s assigned for your new year, I eagerly await your reply and thank you for the opportunity to address this pressing social issue in a direct and personal manner. Yes, stupidly, I recently wrote a balance transfer check that Chase had sent me for 3.99 APR for a limited time. Then, I get a letter from Chase stating they had lowered my credit limit (without any warning) and could not honor the check that I wrote for supplies for my small business. Now, I have to deal with the returned check fees, the embarrassment, the damage to my reputation and the damage to my credit score. I am a concerned and frankly angered customer of Chase Credit. I had a 5.99 percent APR on my Chase Credit Card and rarely used it. This year I did take advantage of the credit line for tuition and automotive repairs. I will be able to pay it off fairly promptly. My disdain with Chase is that soon after the use of my card (which had a 0 balance not long ago), my rate was over doubled and went from a fixed rate to a variable rate (5.99 percent fixed to 12.24 percent variable). I filed a complaint with the Better Business Bureau, and received a call from Paul Bonti- an executive with Chase. He effectively gave me two options to resolve the issue, one- accept the current terms and keep the account, or two- close the account and have the remaining balance reverted to the 5.99 percent terms. Because I will be able to pay off the balance relatively soon, I am going to simply do that and not use the card again, rather than risk damaging my credit by closing the account. Chase is certainly, in my opinion, pursuing a path that “should” significantly damage their reputation. I must admit- I was a happy Chase customer until this year, but now remain unhappy with the resolution of my problem (or lack thereof) and feel a little “betrayed” by the whole experience. Chase will survive without my business, but there certainly should be a concerted, collaborative effort to voice these problems and help ensure that what is happening to Americans who are already suffering, comes to an end soon. I have other credit cards and have not been treated this way by any other bank that I am aware of. PS. I have NEVER been late on a payment to any creditor, including Chase. I have a simple question. My problem doesn’t concern them jacking up my rates. It concerns how they process debit card transactions, and how they purposely overdraft accounts with as many charges as possible. The fact they hold charges for up to three weeks before processing them etc. Does anyone know if there is a class action case against chase regarding this practice? I would love to hear from anyone involved in one or considering filing one. I am upset that Chase has lowered my credit limit and rejected the check they sent to me that they said I could write against my credit limit. They lowered my credit limit from 35,000 to 25,000. I have made my payments on time. When I called them, they just tell you that they have a right to refuse payment. If that’s the case, I think they should make that decision before sending out any checks to consumers. I believe that credit card companies should not be allowed to lower the credit limit after authorizing that limit. Because when they lower that limit it hurts the consumers credit score. I dont think it is right for them to lower limits, when the consumer has been keeping the account in good standing. The credit score becomes not a true picture of the consumers debt paying ability. I’m ready for a class action suit for misleading consumers. Just wondering how everyone’s doing. Any bankruptcies over this? As for me, after speaking to MANY CSRs, we finally decided to do the Balance Liquidation Program through the Hardship Department. Had to close both my accounts and got locked into 6% APR for 60 months, paying less than 2% of the balance every month. Wasn’t satisfied with the new APR since I previously had 2.99% and 3.99%, so I contacted everyone I could (attorney general, house rep, FTC, OCC, etc.). Had almost given up when I got a call from someone at the Chase executive office saying they received my complaint to the OCC. All they were doing was acknowledging my complaint. Weren’t offering to do anything…UNTIL I mentioned that my income had DEcreased and my expenses INcreased. Well, they were going to contact the Hardship Department to see what they could do. They called back the next week and, to my absolute astonishment, offered me 0%!!! I never even gave them new figures (income/expense) but happily agreed. I received all of the new paperwork and it spelled out everything as discussed, 0% APR for 60 months through the Balance Liquidation Program. CHASE ISN’T GETTING A DIME OF INTEREST FROM ME!! They changed the rules in the middle of the game. All I wanted was to pay back what I owed at the terms I agreed to and never defaulted on, and now they’re getting 0% interest back. Smart move, Chase! From Judge Chesney’s 11/20/09 Order on Chase’s motion to dismiss. Judge Chesney threw out all plaintiff claims except Chase’s dealing in bad faith. cannot be resolved in the context of a motion to dismiss. dismissal for failure to state a claim under Delaware law. Do you have other, non-promotional rate balances on the card? Are you using your card for new purchases? Your situation definitely seems out of the norm. If you are using your card and have higher rate balances, you’re a “good customer” to Chase. They may be trying to “be nice” to folks who have balances other than the low fixed APRs. They may have made a mistake including your account with the 5% min payment group of “bad customers” that just pay as agreed. This not so much a rant, but question about what Chase is up to…. Like many others, I had originally transferred a balance to my Chase card in 2006 for a promotional 3.99% APR “for the life of the balance”, paying the usual minimum monthly payment of 2% of the balance. In April 2009, Chase increased the minimum payment to 5% of the balance, and forced me to either accept the new payment, or keep the 2% minimum payment only if i agreed to a new fixed rate of 7.99% on the outstanding balance transfer. Since the 5% min payment was too much to handle at the time, I sucked it up and agreed to the higher 7.99% APR. In my Oct. 2009 statement, I noticed that Chase quietly lowered the APR on the balance transfer back to 3.99%! without any kind of explanation. Obviously I am happy about this, but we all know Chase is not doing this just to be nice. Does anyone know what happened, and why they voluntarily lowered the APR back to the original promotional rate? Judge Chesney’s 10/20/2009 Proposed Order on Chase’s motion to dismiss the check loan class lawsuit is very favorable to the plaintiffs. Followed by filings from both sets of lawyers. Hearing scheduled for 11/13/09 was canceled by Judge Chesney. She will rule on the motion based on filed documents. Status conference scheduled for 12/11/09. Click my name above for details. FYI – Jamie Dimon, CEO of Chase about bank regulation. Raed the comments at the end of the piece. Credit card was under credit limit. Chase added a finance charge – put the account $9.00 over limit. Then they add a $39 over limit charge. And this is after the APR was raised (twice), after the due date was changed…told the ‘helpful’ customer service rep that I was closing the account when she refused to waive the over limit charge. This is usury and it needs to stop. I have two Chase Credit Card accounts, both holding a balance. One was through CitiBank that was bought out by Chase about two years ago. I am a long time customer, and I always pay my balance on time through an electronic debit. I pay at least the minimum balance, and occaisionally I pay more. I secured a 2.9% for the life of the loan balance transfer offer from CitiBank that Chase took over. Through my second Chase account, I have a 6.9% for the life of the loan balance transfer offer. Needless to say, they raised my minimum payment from 2% to 5%. I have spoken to customer service, and been called by Chase in order to get me to change the terms and raise my APR to 7.9%. I asked them what guarantee I had that they wouldn’t then again try to raise the rate. The Rep gave me the “I understand your concern” line but basically they can do whatever they want. I explained that although I know she is not the decision maker, just the bearer of bad company policy that I don’t appreciate being blackmailed, which is what Chase is, in effect, doing to all of it’s customer base. I hope Chase is hurt by the ill will they are causing and the feeling of powerlessness it engenders in it’s customers who, in this economic climate, are at their most vulnerable. LET THE FREE MARKET BACKFIRE ON CHASE VISA! Chase increased my card interest rate 4 points despite an excellent credit rating, never being late with payments in 20 years, and using credit regularly and responsibly. We ALL need to close our Chase cards RESPONSIBLY so as not to adversely impact our credit ratings and enroll in a local credit union that has a good track record for service and is financially sound. These credit unions do exist and I’ve found a credit rate at 7 to 8% and it is not an introductory rate that is subject to change. 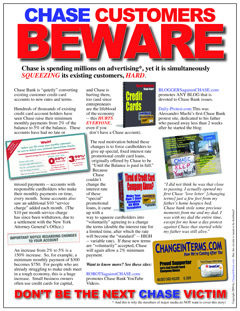 SPREAD THE WORD – maybe we can close down Chase’s credit card operation rather than fight Chase for incremental paltry improvements.